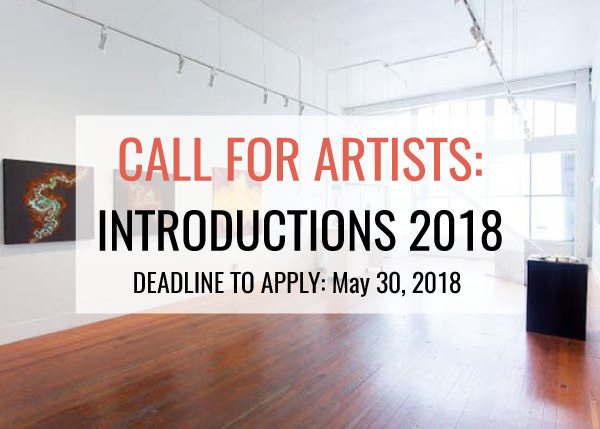 Root Division invites artists working in all genres to submit work for our annual juried exhibition, Introductions 2018. Each year, Root Division presents the work of 12 Bay Area artists in an exhibition and catalogue that is juried by three prominent arts professionals. The exhibition will take place August 30 - September 29, 2018 at Root Division. ▪	Artists must be living and/or working in one of 9 counties of the San Francisco Bay Area. ▪	Artwork submitted for review (or work very similar in nature to that submitted) must be available for listed exhibition dates. ▪	Artists cannot have existing gallery representation in the Bay Area. Please submit the following materials in a single email to submissions@rootdivision... with the subject line "Introductions 2018_Last Name". Please limit attachment sizes to 10MB. ▪	4 images (jpegs: 72dpi) AND/OR a link to 3-minute clip of video on Vimeo or other video platform. Please label each jpg as "Last Name.Image Number" i.e. "Cortez. Image 1"
▪	Please note that the $20 fee must be on file by 05/30/2018 for the email submission to be considered. Please call 415.863.7668 or email samantha@rootdivision.org with any questions.